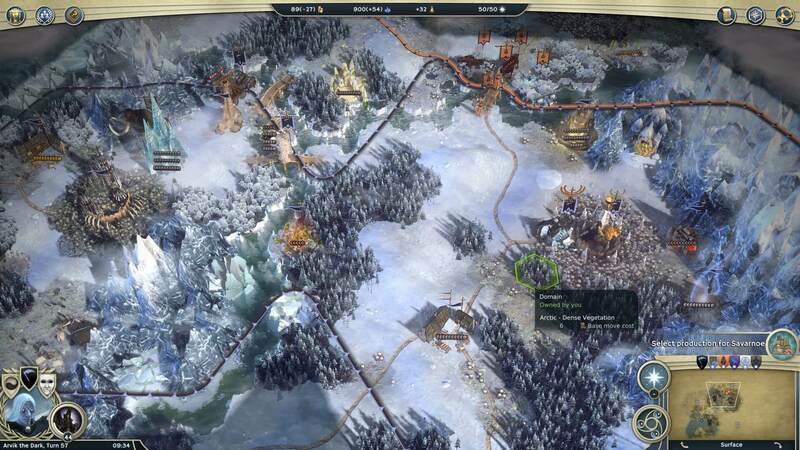 Age of Wonders III is a deep 4X strategy game that encourages you to dig and uncover its hidden treasures. The Eternal Lords expansion accomplishes what expansions should, deepening gameplay and planting new mechanics for you to unearth. The second DLC Expansion for the long-awaited Age of Wonders III. 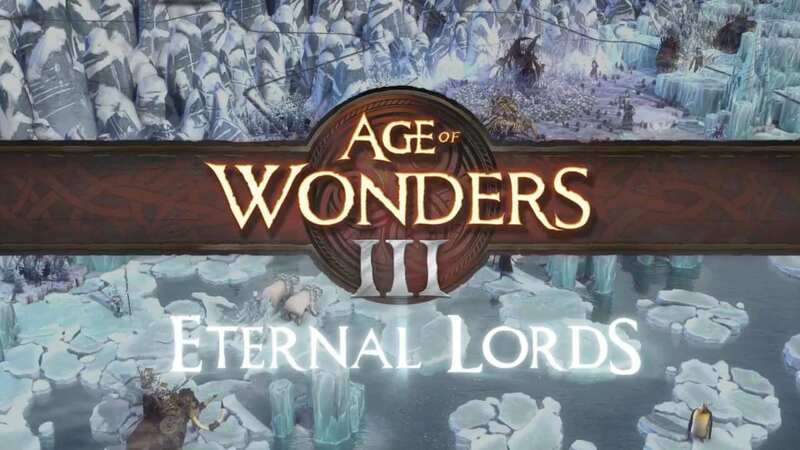 Eternal Lords is an expansion that utilizes what is already great about Age of Wonders III and extends it. There are two new, expansive races; the macabre Frostlings and the feline Tigrans. A new campaign, highlighting the Necromancer class, brings to life an interesting hero, Arvik the Dark. Along with a wealth of new units, heroes, and spells, there are two new maps to explore inside of scenarios. A bunch of fresh items and an assortment of artifacts mixes up the game, changing the way you use your hero in battle. Also included in the expansion is the “Unifier” victory condition that adds a separate objective to maps. With new content comes optimized game performance as well. Improvements on rendering lead to a much smoother gameplay experience. Eternal Lords focuses on the Necromancer class. The hero at the center of the campaign, Arvik the Dark, wields unique spells that focus on enhancing and raising the undead units under his command. The Necromancer class encourages a different style of play opposed to the typical Age of Wonders III approach–both on the battlefield and throughout the campaign. One of Arvik’s spells raises cities from destroyed areas, which quickly expands your territory while remaining mobile. Happiness and morale balancing becomes obsolete due to cities’ population being made up by Ghouls. Apparently, Ghouls have no need for frivolous happiness. Population growth in Eternal Lords is distinct as well. 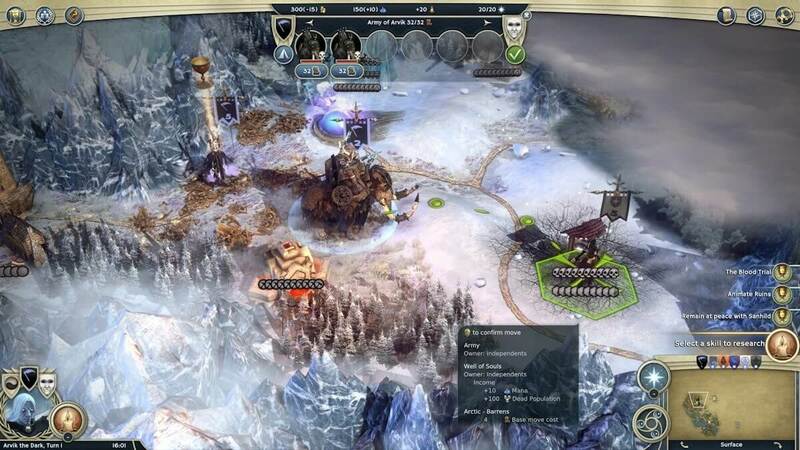 Killing enemy units will increase your nearest cities’ population; this lends itself to the Necromancer’s mobile play style. Buildings, like the embalming guilds, also bolster the population. You can optionally use this population like a resource in order to fuel your army and expand your empire. Just like every element of the Necromancer, there are drawbacks and benefits to each gameplay choice you make. Although AA can be boxy, the world is gorgeous and convincing. The Necromancer units in Age of Wonders III are a blast to play. 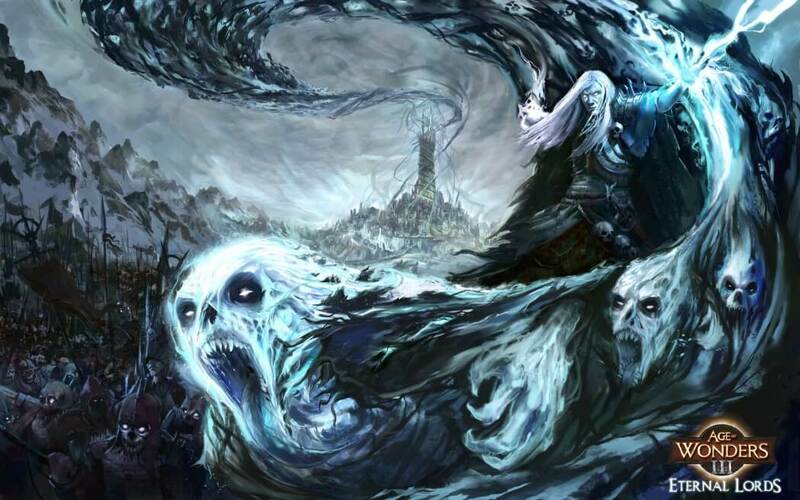 The race focuses on raising undead units while moving, like the Banshee. The Banshee has a spell that demoralizes the enemy with a debuff in a wide circular radius. Other units do more damage against low morale enemies, enabling these deadly combos to be initiated. 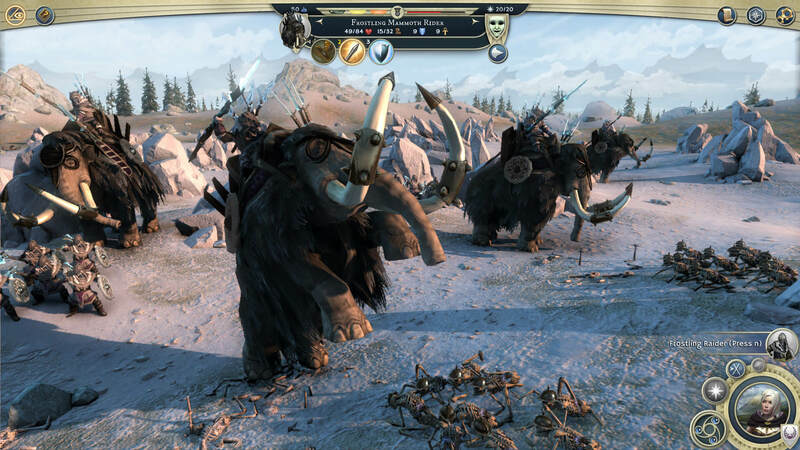 The Mammoth is a new unit that is singular and powerful. 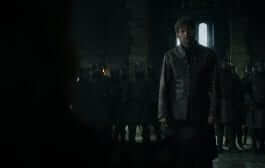 Its melee attack is unmatched and has a charge that devastates enemy units. Nearly all the new characters make use of a status affliction called “chilling,” which increases the chances of freezing your opponent entirely. These units create a unique and exciting combat experience that doesn’t diminish the belief of controlling the hordes of the undead. All the various items and upgrades make leveling Arvik and Rowlar, a Tigran Arch Druid hero, enjoyable. You can mold these heroes to play any way you’d like them to. 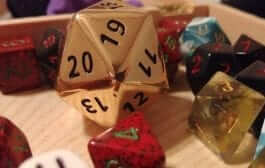 They can excel in ranged combat, be devastating with an artifact melee weapon, or cast life-draining spells. The hero leveling alone feels like a game within itself, and gathering items to buff your heroes is rewarding in its own right. Once you get far enough with your hero, you become attached to his power and abilities. Age of Wonders boasts plenty of tasty RPG elements to savor. The campaign doesn’t hold your hand. It allows a certain amount of freedom and unlocks story narrative as you progress. Remaining true to a strategic role-playing game, Age of Wonders allows you to make your own choices and to suffer the consequences. The campaign has many branching paths that will adhere to your experience, offering different adventures and outcomes every time you play a new scenario, map or campaign. The new alignment feature is a good example of this. It impacts diplomacy and your empire’s expansion depending on good, neutral or evil alignment. Speaking of not holding your hand, Age of Wonders hardly even helps you learn to play the game. Luckily, being an avid strategy gamer of the likes of the Total War Series and Civilization, I was able to get through its steep learning curve somewhat quickly. 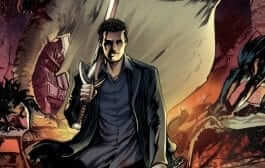 However, novice players may be lost before being able to put enough time into the game to learn it. One reason for this is the absence of a manual and the relatively hard to digest tutorial. The tutorial hardly scratches the surface of the game’s mechanics and idiosyncrasies. Only after hours and hours of gameplay will you start to comprehend the game, and this is when the experience starts to become engaging. Your dominion spreads like a plague as the Necromancer. Age of Wonders’ deep gameplay gives just as much as it takes. The interface can be cumbersome, but the world is beautiful, and its fantasy setting is more inviting than similar games–such as Civilization. The learning curve is difficult and a lot is hidden in the weeds. Nonetheless, once you delve deep enough and uncover its complexity, a truly wonderful ordeal awaits you. 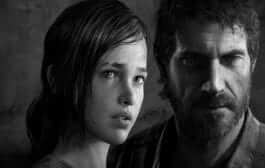 Gameplay: There exists a lofty learning curve that needs to be conquered before the game feels natural. The battles and empire-managing are enjoyable once you learn the mechanics. The many different gameplay options from Campaign to Scenario to Random Maps will keep the game fresh. The new units and specifications allow for more to be discovered. The battles can get to a point where you’d rather automatically finish them than manually enact them; however, it should take a long time to tire of the overall game. I can see hundreds of hours being lost in the Age of Wonders world. Graphics: There is a noticeable lack of anti-aliasing, resulting in boxy-looking units and unseemly textures. There are just enough graphical options available for tweaking, but even on Ultra, the battles and, close-ups leave a good amount to be desired. Though there are dated graphics in some areas, the map and world look beautiful. Overall, the game runs well and has hardly any lag. Sound: Michiel van den Bos, who also provided the soundtrack for the Overlord series and the previous Age of Wonders games, has created an elegant and fitting musical score. The chamber-orchestra-like soundtrack is pleasant enough to listen to on its own. The battle and interface sound effects are convincing. However, the absence of voice recorded narration is glaring, requiring a great deal of reading. Presentation: The map and world are labyrinthine. You want to explore everything just around the fog-of-war corner and you feel the need to uncover the world’s depth. Managing your empire doesn’t bog you down as much as other 4x strategy titles, and even though you need some patience, the game’s pace eventually picks up. Marking one year of continuous development since its release, Eternal Lords introduces the Tigran and Frostling races and the new Necromancer class. Players must adapt to a world on the brink of cataclysmic change. 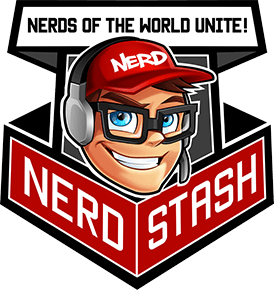 New mechanics such as the Race Governance system, which allows players to tailor the features of each race in their empire to meet their strategic needs, add new layers of depth to empire development and diplomacy. Embrace forbidden powers and reign for eternity!